The Font in Mellor Church has intrigued many visitors and local historians over the years. It is carved with intricate designs of Scottish and Scandanavian influences and an apparent amalgamation of early Christian and pagan styles. "It is not known when the first Church was built on the hilltop. The tower dates from the 15th Century, which is many hundreds of years later than the carving of the font. Experts give a possible date of the late Saxon or Early Norman (11th or 12th centuries) but they disagree�as to the significance of the curious carvings of men and animals. Many people say that the carvings show similarities to those on Viking monuments. We will never know if it was originally made for an earlier church at Mellor or whether it was brought from elsewhere. One local story says that when the south and east galleries were erected in 1782 the font was removed along with the pulpit into the tower. If so there are no reference to the installation and removal of another font. One tale even says that it was taken from the church and used as a cattle trough! The font was for many years situated in the west end of the nave, it was moved to its present position when the new organ was installed in 1977". It particularly interested a visitor to one of our Open Days, Kevin Kilburn, who set out to try to understand it further and to examine its possible connection with the Mercian Crosses of the Cheshire and Staffordshire Moorlands. His reserach has led him to beleive that its origins could be even earlier than previously thought. 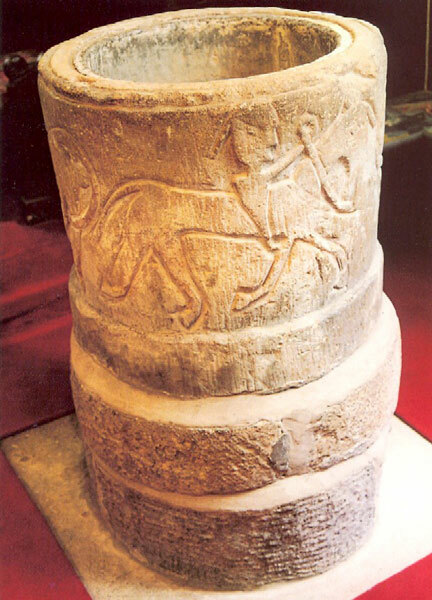 Watching a Time Team programme filmed some years ago at Govan Old church, Kevin noticed a Hogback Stone carved with a horseman similar in style to that on the Mellor font. He contacted Robert Melvin, Senior Elder at Govan Old Church who kindly sent him two pamphlets by Dr Anna Richie, "Hogback gravestones at Govan and beyond 2004", and "Govan and its carved stone 1999." The latter has an illustration of the horseman on a sarcophagus thought to date to the 6th Century, thought to depict a local king and appearing stylistically similar to that on the Mellor font, although the carving is much more detailed. The animal in the far right hand panel however is less well executed and also has its head turned to look backwards, as does the font. Another illustration is of the Tyninghame Hogback which depicts an opposed pair of beasts with tails stylistically similar to those on the Mellor font. Ritchie cites Stephenson 1959, "The Inchyra Stone and some other unpublished Early Christian monuments".Proc. Soc Antiq Scot, 92 (1958-9) as this imagery interpreted in terms of Norse pagan mythology. 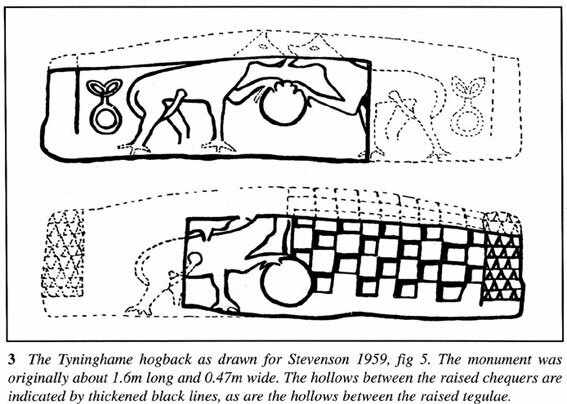 Another paper entitled Hogback monuments in Scotland, makes the observation that: "Whilst the iconography of the carving at Tyninghame is convincingly Viking in character, the zoomorphic style is native to Scotland. The naturalistic stance and proportions, coupled with the tail's curling between the hind legs, are characteristics of animals found on sculpture throughout Scotland." Elsewhere in this paper is a note that the hogback is a stylistic representation originating in Yorkshire of a house tombstone as exemplified in the tumba of St Chad.